New book, 256 pages with 153 colour pictures, 43 tables and 25 drawings. The modern aircraft carrier is without doubt one of the most exciting and hazardous operating environments in the field of warfare. The ‘flattop’ is a symbol of global military power without parallel, and it remains a capability beyond reach of all but the most well equipped navies. With the detail, precision and accuracy expected of Harpia Publishing, this latest volume provides a force report of the various air components and associated vessels fielded by those select nations that field fixed-wing-capable aircraft carriers. 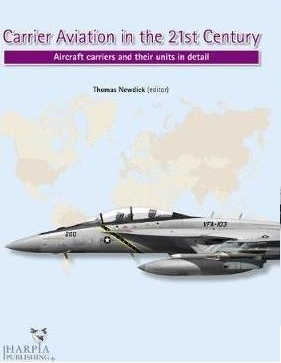 While the United States maintains a carrier fleet the size of which is almost incomparable to that of its rivals, the coverage of this book also extends to the smaller nations that only possess a single carrier: Brazil, France, Russia and Spain. Meanwhile, full coverage is given over to the navies that are in the process of expanding their burgeoning carrier aviation capabilities, through the introduction of new, indigenously designed carriers and aircraft, namely the Asia-Pacific rivals China and India. Within Europe, chapters are devoted to Italy, currently with two carriers in commission, and the United Kingdom, which will make a historic return to carrier aviation this year. Since the scope of this volume extends to navies operating any carrier that routinely embarks fixed-wing air power, US Navy amphibious assault ships and US Marine Corps aviation assets are also included. Drawing upon a cadre of authors who are experts in their field, Carrier Aviation in the 21st Century continues Harpia’s reputation for providing unprecedented detail and extensive technical specifications, as well as detailing the structure of all the air arms and the individual units that currently embark on board carriers. Illustrations include specially commissioned artworks and diagrams to help illustrate how carrier air power remains an essential element of modern warfare.